Enjoy this christmas season holiday with Christmas decorations and ornaments from TasselnFringe.com. Whether you're decorating indoors or outdoors, TasselnFringe.com has just what you'll need to make your home and yard festive for the holidays. We have also a collection of Christmas stockings, Christmas ornaments and tree trim, artificial Christmas trees, Christmas lights, Christmas wreaths and garlands, holiday party supplies, Christmas stockings, holiday inflatables, beaded accessory, window decoration, beaded crafts, crystals, christmas decorations, Tassles, Garlands, handicrafts, trims, christmas decorations, treehangings, christmas tree decorations. It's easy to shop for Christmas decorations at TasselnFringe.com by category, type, color, price range, customer rating, or best sellers. In addition to our Low Prices, you can save even more at TaaselnFringe.com. So get ready for the holiday season when you stock up on Christmas decorations at TasselnFringe to save money and live better. To liven your spirits & sparkle your home, we have made decorating, one of the joys of the holidays. 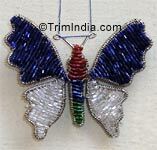 These are finely handcrafted with colorful beads in metal becomes an excellent accent for decorating Christmas Tree.